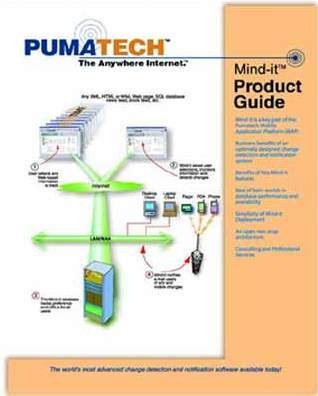 The Mind-it Product Guide was prepared for Pumatech Inc. of Santa Clara CA., the leader in second generation wireless technology. Mind-it is the world's most advanced "change detection and notification" software available today. The report contains 35 pages with 5 color illustrations, 2 tables, cover page, title page, back cover and an informative 7 page Glossary of Terms. The report was designed to increase product awareness and describe business benefits of Mind-it's for Internet portals and enterprises deploying leading edge Internet technology. It has been very useful as a sales and marketing promotional tool for the intended target audiences. The first major Internet application is accepted to be Search Engine technology, and the second is "change detection and notification technology" as represented by Pumatech's Mind-it software. Search technology allows both corporate and consumer users to find important information. Change detection and notification software allows these users to keep track of important information once found. Mind-it provides major productivity benefits to the enterprise by relieving employees of the need to constantly check for updated current information on the Internet. For B2B or B2C firms a major benefit of Mind-it is to increase the "stickiness" of a site by bringing users back to the Mind-it enabled site as changes are detected anywhere on the Internet and users are notified of these changes. The report also serves as a cornerstone for training new employees in the inner workings of this advanced Internet software product. To view a .pdf file of this report please click here.